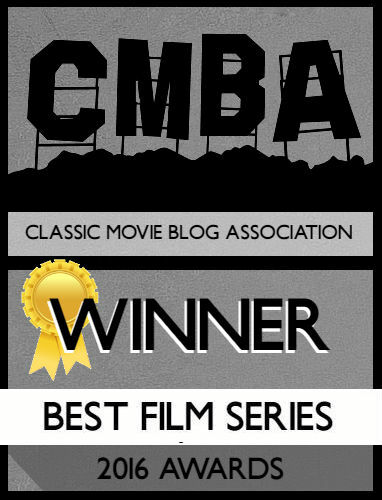 via: https://www.imdb.com/title/tt0039377/mediaviewer/rm348928768 Unless otherwise noted, all images are my own. Fiesta (1947) is an improbable film even for MGM in the 1940s. It stars Esther Williams, though she swims just once and very briefly, and instead spends far more time as a bullfighter. (Told you it was improbable.) 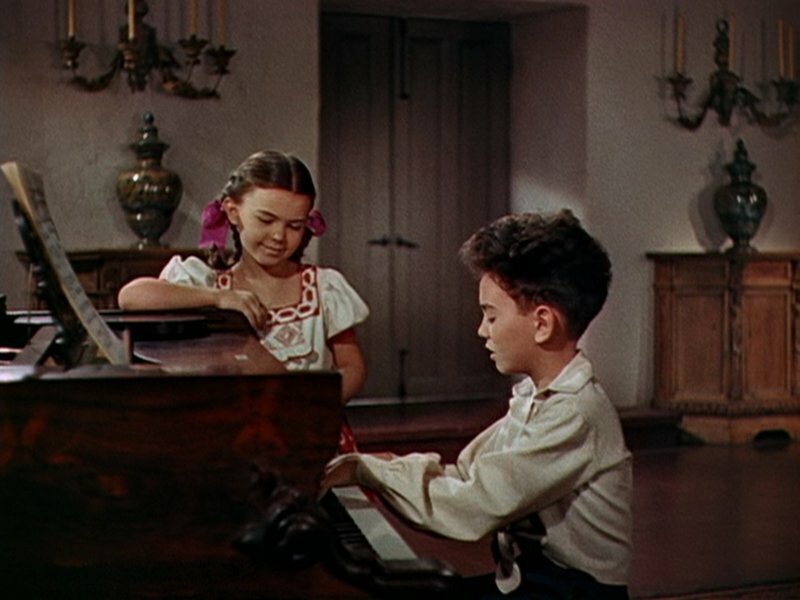 Besides Williams, Fiesta stars Ricardo Montalban, in his Hollywood feature film debut, as a bullfighting musical prodigy. 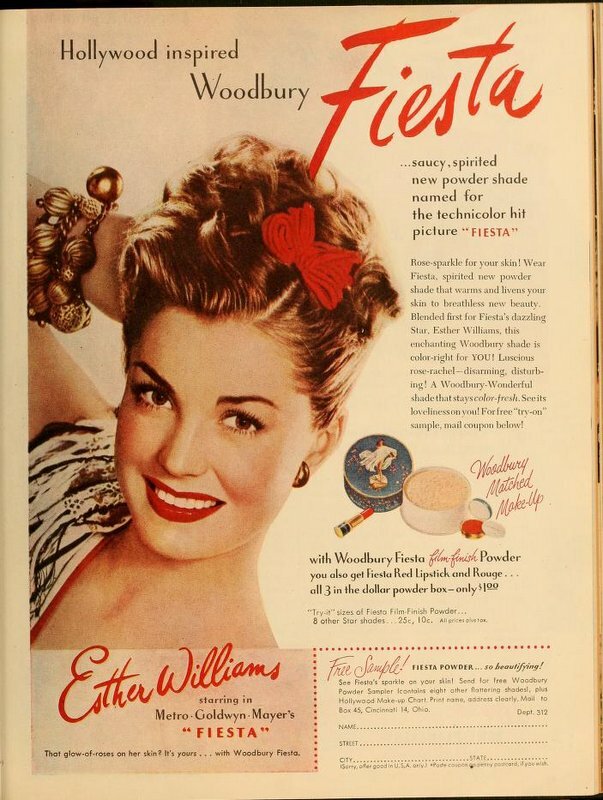 Why make a movie featuring Esther Williams as a matador? 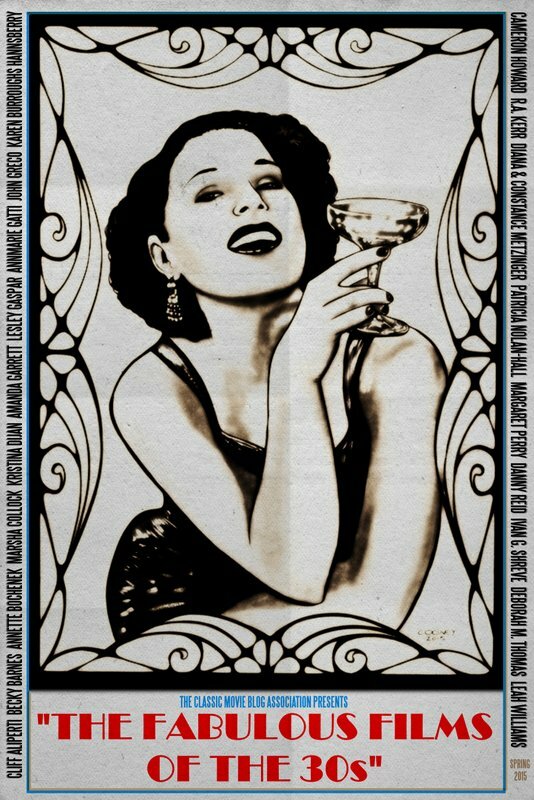 One reason is due to the Latin American craze in Hollywood in the 1940s. It was an extension of the Good Neighbor Policy and part of a coordinated propaganda campaign during WWII led by a government office called the Office of the Coordinator of Inter-American Affairs (OCIAA). A driving force behind this trend early on was the fact that Europe was shut to American films because of the War, so Hollywood needed to beef up its exports to Latin and South America. So movies feature stars like Xavier Cugat and Carmen Miranda, films set in Brazil, Mexico, Argentina, etc., and cartoon characters visiting our neighbors to the south. 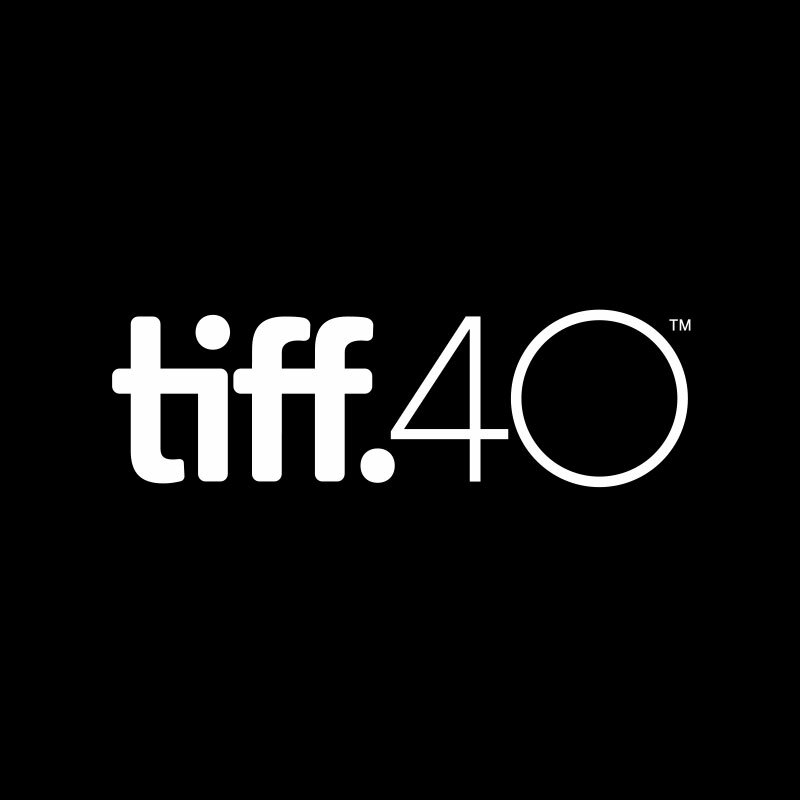 The OCIAA worked with Hollywood to get more “positive” depictions of Latin America into the movies. That could mean including Xavier Cugat or Carlos Ramirez, sending Jane Powell, Betty Grable or Esther Williams south in movies like Nancy Goes to Rio (1949), Down Argentine Way (1940), and Easy to Wed (1946). Often films include a musical number in Spanish or Portuguese, or star a “Latin Lover” like Ricardo Montalban or Cesar Romero. Even after WWII ended, the Latin American trend continued. So it’s no surprise that MGM decided to cast one of its newest and most popular stars in a movie set in Mexico and centered around an important element in Mexican culture, bullfighting. 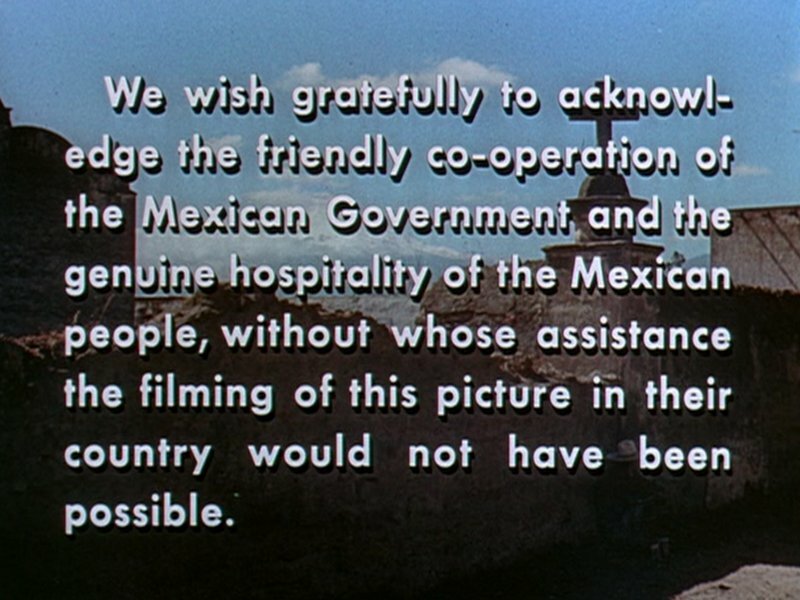 MGM even filmed for three months on location in Mexico, mostly in the town of Puebla, instead of staying on the backlot in Culver City. So watch for shots that emphasize the “real” locations. Richard Thorpe, who had directed (and clashed with) Williams in Thrill of a Romance (1945), took charge of this movie, too. The location shooting almost sent him over the edge, but he and Williams at least reached an impasse so that there weren’t more blow-ups on set like the one they’d had on Thrill. Their working relationship may also have improved because Williams was now a bona fide star, not a rookie actress without much clout. 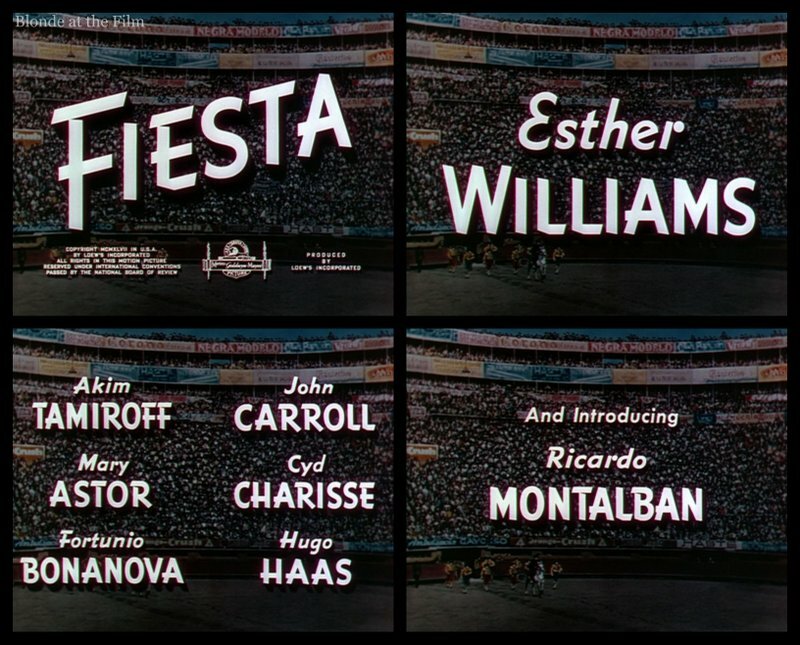 In fact, Fiesta was the first time Williams got top billing–as you can see from the opening titles, her name is THE name and everyone else’s appears after hers and in much smaller type. But this was only her fifth starring role after Bathing Beauty (1944), Thrill of a Romance (1945), The Hoodlum Saint (1946), and Easy to Wed (1946). (I don’t count her one number in Ziegfeld Follies (1946) or her brief cameo in Till the Clouds Roll By (1946) in this list). Also, in Williams’ previous four movies, she was paired with male stars who were reliable box office draws: Red Skelton, Van Johnson (twice), and William Powell. But now she was the box office draw paired with a newcomer (Montalban), which shows MGM’s confidence in her audience appeal. 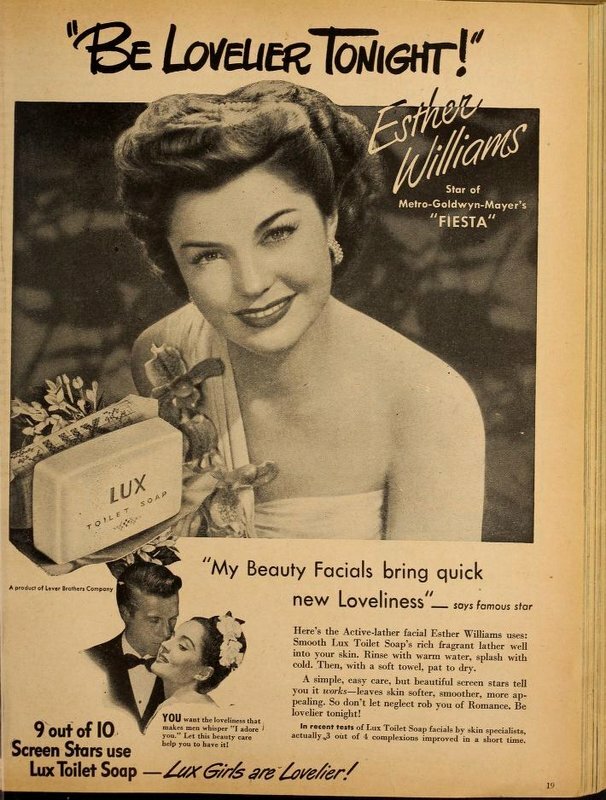 And even though the studio changed up the formula for an “Esther Williams movie” quite a bit by removing swimming scenes and tinkering with the romantic plot lines (both couples in the film are already paired up when the movie begins and the conflict revolves around other issues, not their relationships), audiences still came in droves. The second star of the movie is Montalban, a Mexican actor who came to Hollywood in the late 1940s and had an extremely long career, including iconic roles in television and films such as Star Trek (as the original Khan) and Fantasy Island. He and Williams play twins in this movie, and they worked together twice more in On an Island With You (1948) and Neptune’s Daughter (1949). 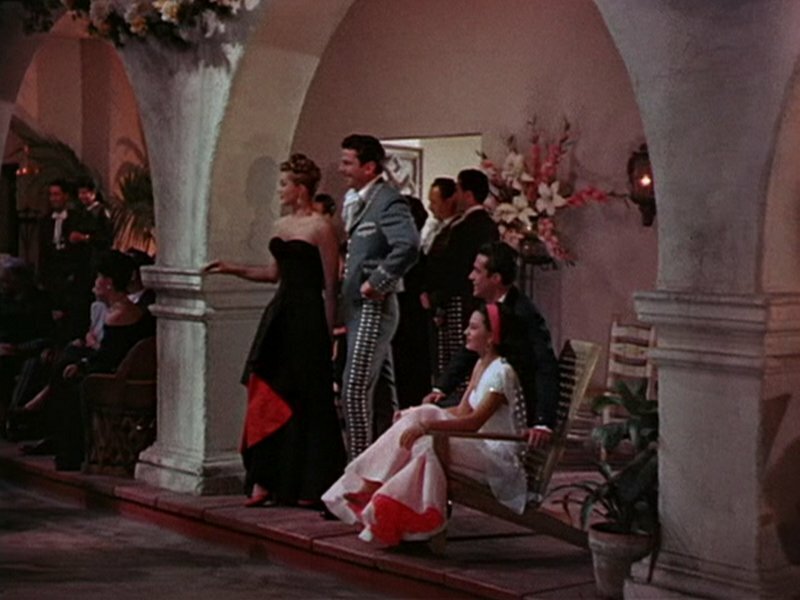 Montalban’s love interest in Fiesta is Cyd Charisse, who had recently made a splash in The Harvey Girls (1946) but was a few years away from her breakout role in Singin’ in the Rain (1952). 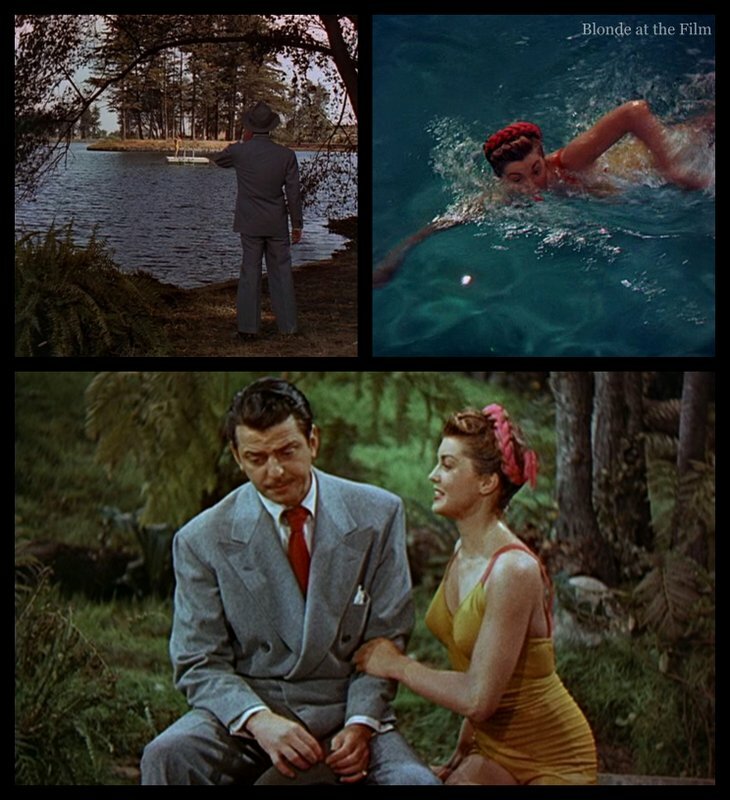 She would show up in On an Island With You, too, as well as a brief cameo with her real life husband, Tony Martin, in the Esther Williams’ movie Easy to Love (1953). Williams’ love interest is John Carroll, who was most famous for his roles in westerns in the 1930s and never achieved huge stardom. 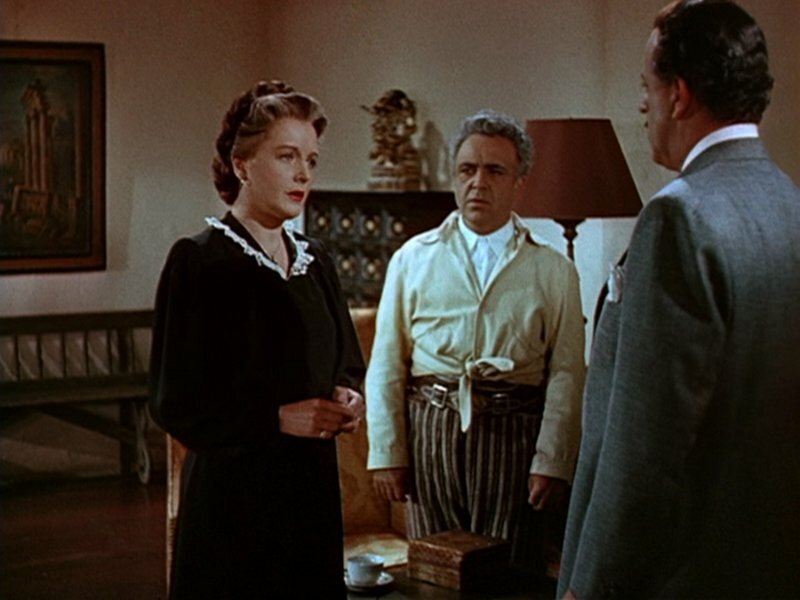 Fortunio Bonanova, a Spanish actor, plays Williams and Montalban’s father, and Mary Astor is their mother. You may recognize Astor from tons of roles in the 1930s and early 1940s before she made the jump to “mother parts,” perhaps most famously in Meet Me in St. Louis (1944). As I mentioned, Fiesta is entirely set in Mexico, and all the actors play Mexican characters. Which brings me to this note on “whitewashing,” when (usually) white actors play characters of other races or ethnicities. Today, it’s very controversial and there can be huge backlash when a white actor plays an Asian character, for example. It’s now the accepted policy that films should be as authentic and diverse as possible; so, for instance, casting actual Native American actors in Native American roles instead of Hispanic or white actors, as was the practice for so long in classic Hollywood. The controversy has recently extended to gender identity; you may have heard about the outcry in July 2018 when Scarlett Johansson was cast as a transgender man. She eventually dropped out of the film. It’s great that Hollywood is more conscious of representation and diversity–it’s taken them a very long time, and there is still progress to be made. But this wasn’t part of the studio era’s mindset at all. Many white actors performed in blackface, African-American representation on screen is either absent or (usually) demeaning, and overall the movies are almost entirely white. 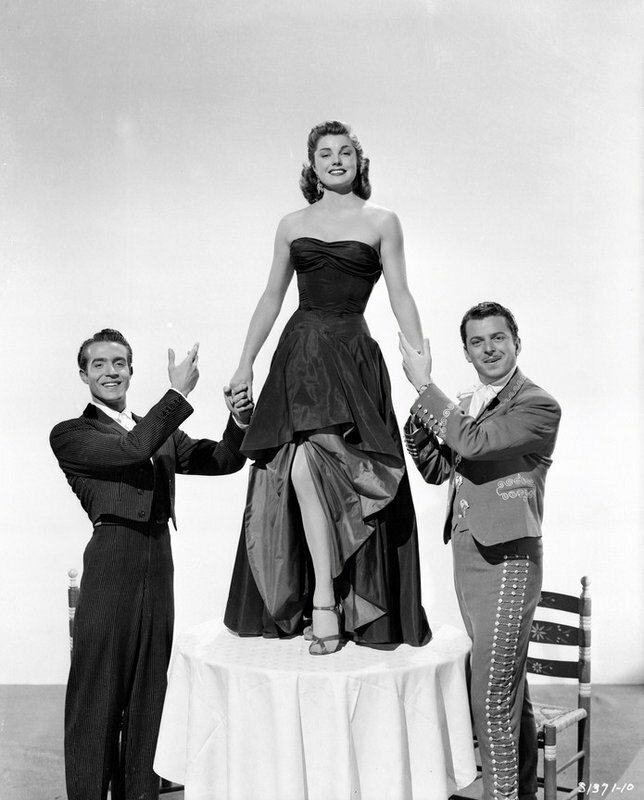 So today, casting Esther Williams, Cyd Charisse, and Mary Astor as Mexican women, and John Carroll, Hugo Haas, and Akim Tamiroff as Mexican men, would be incredibly controversial, and most likely would never happen. But in Fiesta, even some minor characters like ticket sellers or policeman are played by white actors and lack Mexican accents, so it’s not just the stars in whitewashed roles. MGM never gave it a second thought, and it doesn’t seem that audiences did either. Besides the overt whitewashing, this movie is generally positive in its representation of Mexico and Mexican characters, so it’s not as bad as it could be? There’s no easy answer. Fiesta is a product of its time, and I don’t think one should just throw it out because it doesn’t fit today’s expectations, but it also shouldn’t be given a free pass, and it’s important to acknowledge how things have changed. I’ll leave it there and let you decide. To the film! We open at a bullfighting school where legendary retired matador Antonio Morales (Fortunio Bonanova) watches his students practice. But he is suddenly summoned home because his wife (Mary Astor) has gone into labor. He rushes back to his beautiful estate (according to AFI, this is the Hacienda San Antonio Chatlou) where the doctor hands him a newborn girl. As the twins, Mario and Maria (seriously?) grow up, Antonio makes Mario (Joey Preston) spend hours in the bullfighting ring with his trusty sidekick Chato (Akim Tamiroff) playing the bull. The famous father is determined his son will follow in his matador footsteps. Antonio doesn’t realize that Maria (Jean Van) secretly watches the lessons, too, and becomes an adept bullfighter on her own. Mario is a fine bullfighter, though his father worries that he lacks focus. He’s right; Mario’s true passion is music and he’s a piano prodigy. Maria and his mother encourage his playing and composing, but Antonio never takes it seriously. On the eve of the twins’ 21st birthday, the Morales household is all atwitter. Antonio is excited because the next day Mario will make his debut in the bullfighting ring. 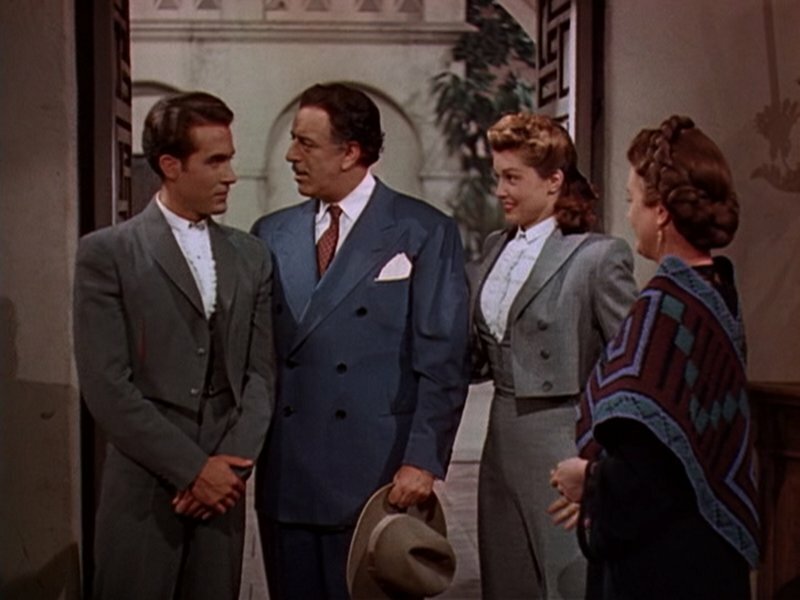 But Maria (Esther Williams), Mario (Ricardo Montalban), and their mother (she never gets a name) are excited because Maria secretly sent Mario’s symphony to Maestro Contreras, the director of the Mexico City Conservatory and Symphony. They expect to hear from the powerful musician the next day. That afternoon, Mario runs off into town to meet his sweetheart, Conchita (Cyd Charisse), while Maria goes for a swim. Her fiancé, Pepe (John Carroll) shows up early so she dashes through the lake (which suddenly becomes aqua-colored and crystal clear in the close-ups) to greet him. He is the one who took Mario’s symphony to Mexico City, so she is anxious to hear what Contreras said. It’s good news: the maestro was so impressed he was speechless, and promised to come to the Morales estate the next day to speak to Mario in person. Oddly, this is the only swimming or bathing suit scene in the whole movie, and it lasts just a few seconds. MGM gambled that audiences wouldn’t care if the “swimming movie star” barely swam in this movie, though it seems like an odd decision. Anyway, that evening Mario and Conchita party with their friends even though he really should be preparing for his bullfight. 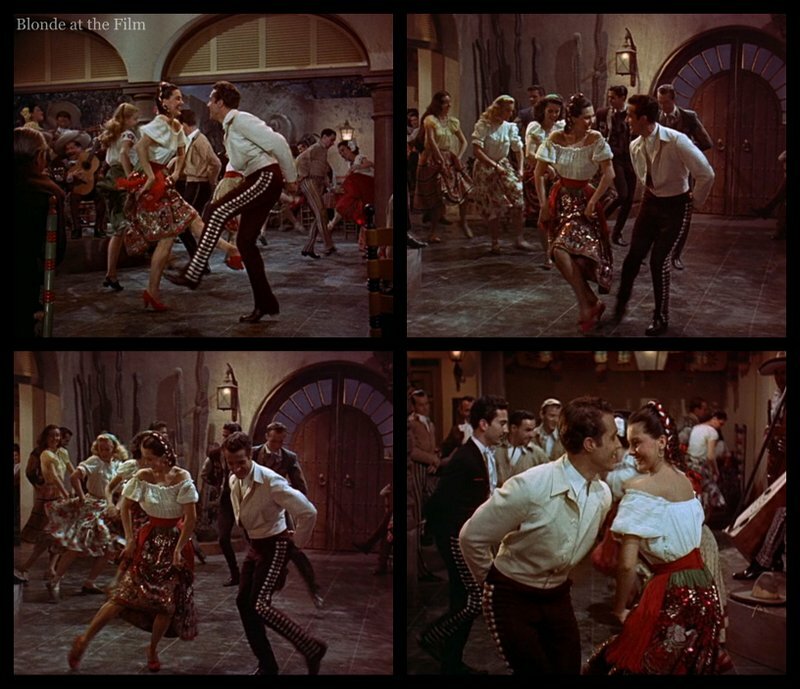 But when you have Cyd Charisse and Ricardo Montalban in a movie, you’d better get as many dances in as you can. 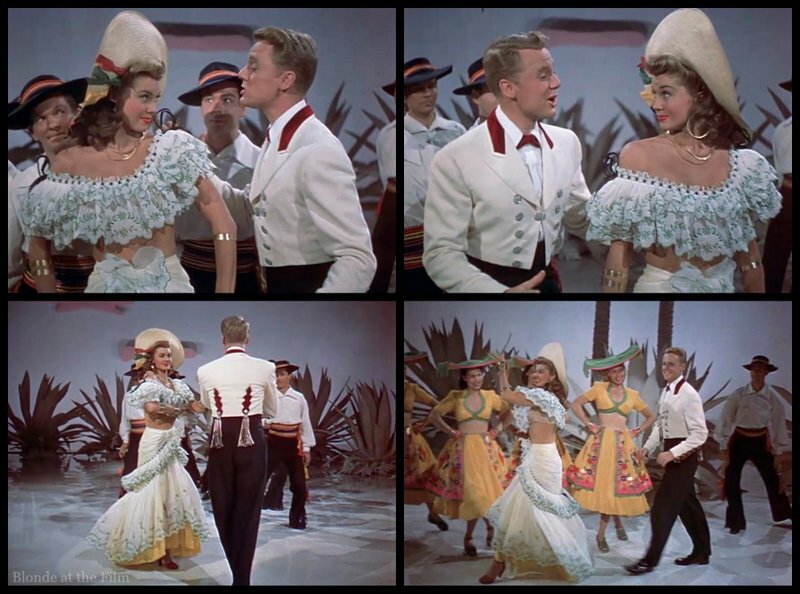 They’re a great pair and would dance together in On an Island With You (1948) and The Kissing Bandit (1949), too. Now that we’ve met all the main characters, let’s talk about accents. Strangely enough, only Bonanova (who was Spanish) and Montalban (who was Mexican), speak with “Mexican” accents. Mary Astor, Esther Williams, Cyd Charisse, and John Carroll don’t even attempt to alter their normal American speech. (Hugo Haas (who was Czech) and Akim Tamiroff (who was Armenian/Russian) use their natural accents so at least they don’t sound so American.) The accents create a weird contrast between Montalban, Bonanova, and the rest of the cast. To make it even more noticeable, the American actors don’t even say the Mexican names correctly: for example, Montalban pronounces “Mario” and “Maria” as “Mah-rio” and “Mah-ria” with rolled Rs. But the Americans say “Marry-o” and “Marie-a.” Same with “Pepe:” Bonanova and Montalban pronounce it “Pep-eh” but everyone else says “Peppy.” It’s wild. 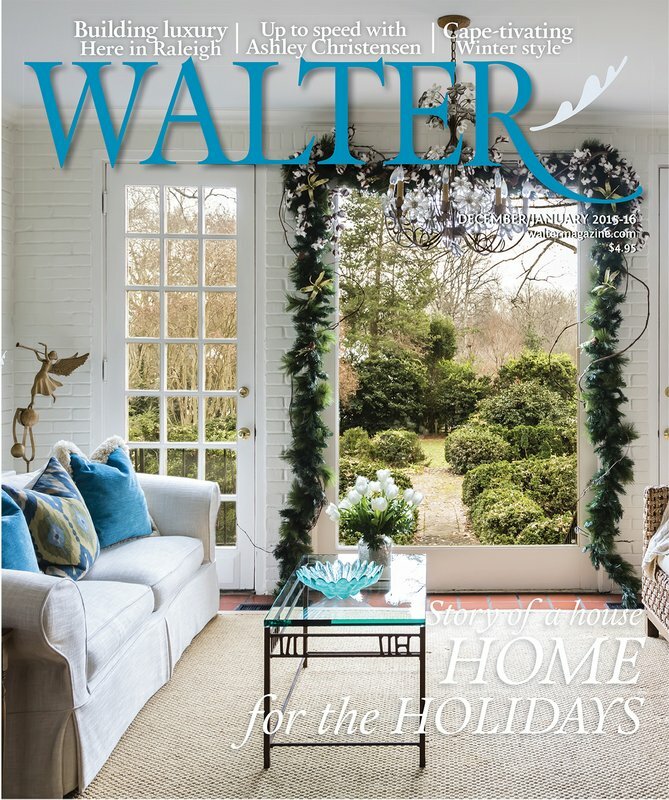 “Oh, I get it,” Esther replied, though she didn’t agree, “When we were growing up, I talked only to my mother, and Ricardo spoke only with his father.” “Just so,” Cummings said. And that was that. Can you imagine if a modern movie included a major logical gap like this? But in the studio era, “authenticity” wasn’t that important. Pepe, Conchita, Maria, Mario, and Señora Morales are confused and disappointed when Contreras never shows up. But they focus on the bullfight, and fortunately, Mario does great. After the fight, the other matadors struggle to get the bull out of the ring, so guess who jumps in to help? Maria is very good with the cape and gets the bull through the door, though everyone is shocked to see her in the ring. A bullfight booking agent is impressed with Mario and schedules him in a big fight in Mexico City in two weeks. Antonio hopes that the accelerated pace of his son’s bullfighting career will make Mario forget about his music. At the birthday party that evening, Maria struggles to celebrate because she is so upset about Contreras’ failure to show up. But at least she has on a pretty dress! At the party, Mario performs with Conchita. 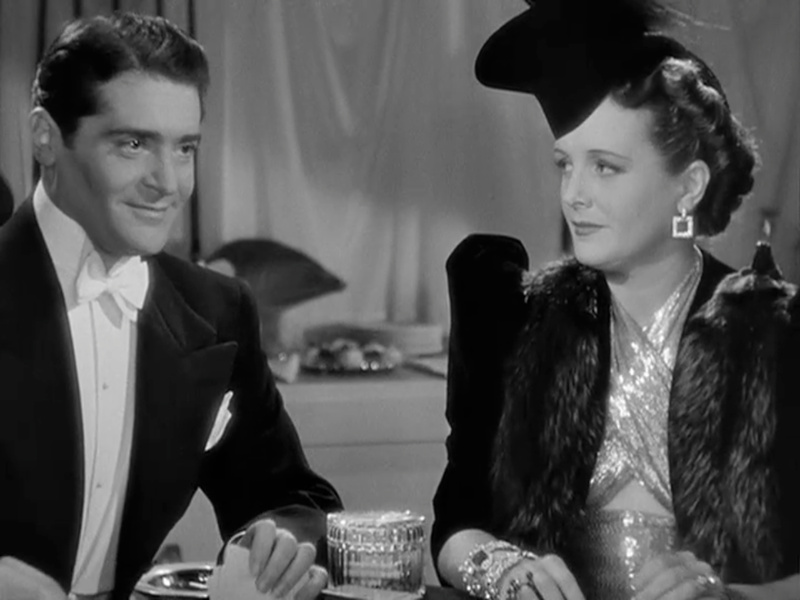 I adore the contrasting petticoat on Charisse’s gown (Williams has one, too! ), and she really works it. It is far from the only flashy petticoat Charisse ever wore, either. It was sort of a trademark. Irene designed the costumes for this movie. As Antonio watches his children blow out their birthday candles, he feels a slight pang of guilt for sending Contreras away, but mostly he’s excited that Mario will finally become a great matador, just as he was. Two weeks later, the family (except for Señora Morales, who worries too much and couldn’t watch her husband and can’t watch her son in the ring, either) travels to Mexico City for the big fight. Just before Mario jumps in the ring, Contreras sneaks down to talk to him. Mario is shocked to learn that his father sent Contreras away and deliberately sabotaged his music career. He is so upset that he runs out of the stadium. The crowds assume he ran out of fear and newspapers publish the story, which devastates Antonio. Maria and her mother are more concerned with Mario’s whereabouts, though. He hasn’t been seen since the encounter with Contreras. Señora Morales is so worried that she confronts her husband and tells him she hated when he was a matador and she never wanted Mario to be one, either. She says that Mario’s disappearance and the damage to the family’s reputation are all Antonio’s fault. If he hadn’t pushed Mario into bullfighting and then betrayed him, none of this would have happened. It’s a big scene from a character that has been pretty passive until now. Then Maria gets an idea: if she bullfights under Mario’s name, surely her brother will show up to confront the imposter. So she, Conchita, and Chato sneak away to fight as Mario. She pins up her hair, gets a matador’s suit, and puts her secret skills to use. These scenes show us a warm relationship between Maria and Conchita, but an even sweeter bond between Maria and Chato. He’s the understanding, supportive father figure that Maria doesn’t really have, and they share some lovely moments. The fight goes great and wipes away the “coward” label. 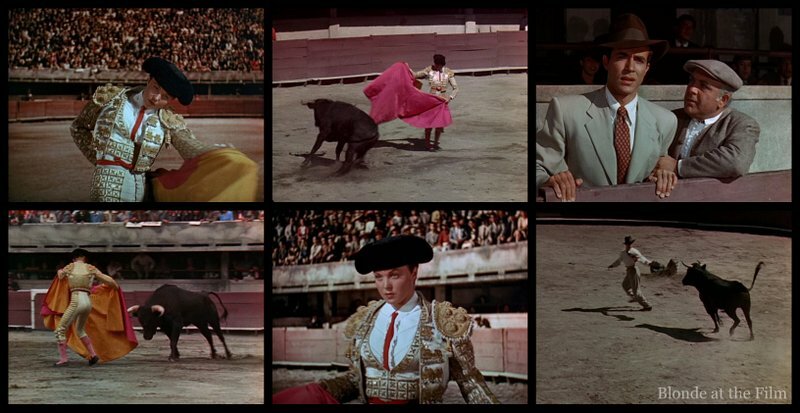 Fun fact: MGM hired coaches to teach Montalban and Williams the basics of bullfighting so that they could appear competent enough in close-ups. But MGM wasn’t going to risk their stars, so the actual bullfighting fell to real matadors. It’s very easy to tell when it’s Williams and when it’s a stuntman. 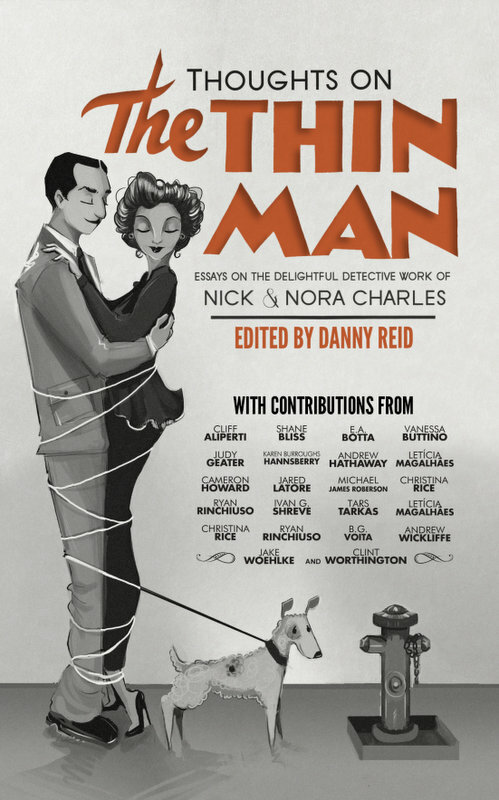 And Williams doesn’t look very manly even in her suit, so the idea that everyone would believe she was her brother seems silly. 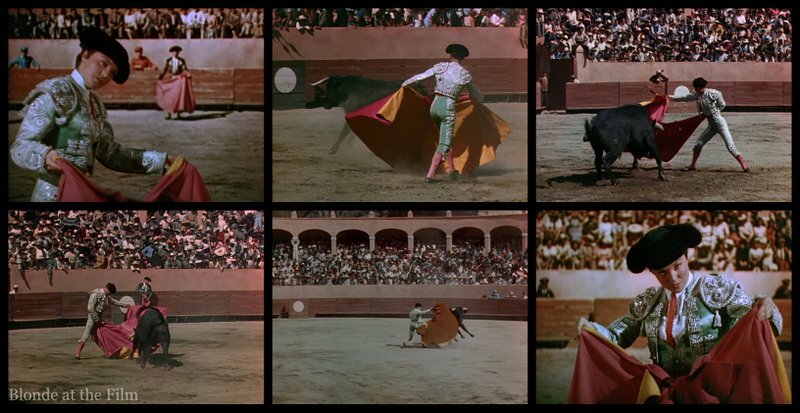 Another fun fact: The matadors were expensive stuntmen, and the bulls weren’t cheap, either. MGM tried to save money by keeping the bulls alive after each fight (traditionally, the animals are killed), but this strategy actually made the fights more treacherous. After a few times in the ring, the recycled bulls “learned” that the matadors weren’t that dangerous and became more aggressive. They started charging the men instead of the capes, and according to Williams’ autobiography, four of the matadors were sent to the hospital with nasty gores. 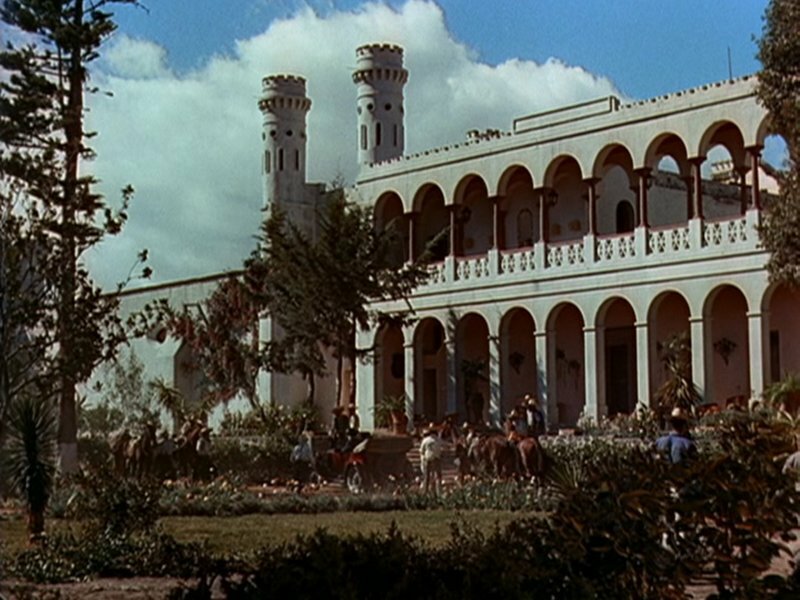 And apparently the residents of Puebla, where most of the movie was filmed, didn’t love how the production altered the cherished traditions of bullfighting. 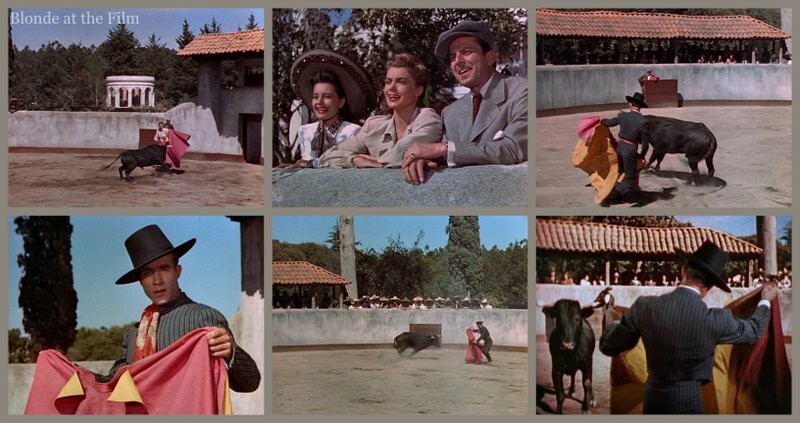 Yet another fun fact: MGM typically didn’t prioritize authenticity, so it’s surprising that the studio contracted an actual Mexican tailor to make the traditional bullfighting outfits, known as traje de luces or “suit of lights,” for its stars instead of turning the project over to its own costume department. 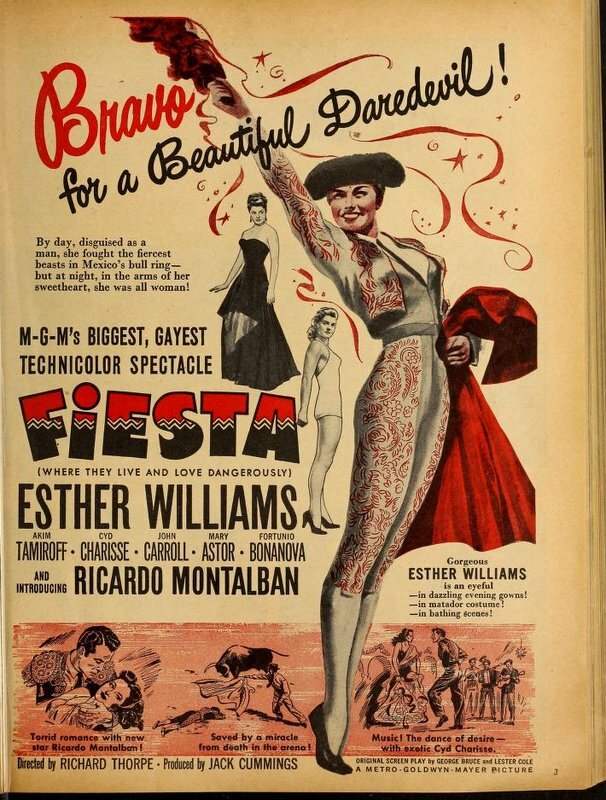 But part of Fiesta’s marketing campaign focused on the authenticity of the movie, with the studio promoting the “real” bullfights, costumes, and locations. So MGM hired a master tailor who duly fitted Williams for the tight, sparkly trousers and jacket. But he refused to make any concessions to Williams’ female form. The short traje de luces jacket traditionally lies perfectly flat across the chest. This obviously posed a problem: Williams joked that “I wasn’t quite Jane Russell, but I did have a bustline,” and the tailor faced a mighty struggle between the jacket and her bosom. He eventually refused to modify the jacket from its traditional style, leaving Williams with an incomplete costume. So MGM sent the unfinished suit to Hollywood where costume designer Irene added bust darts and minimized the impressive crotch bulge in the trousers. Now that Williams could actually fasten the jacket, it was shipped back to Mexico for her bullfighting scenes. Back to the film! After the bullfight, Maria hopes that Mario will immediately resurface, but he doesn’t see the news so stays hidden. But her parents read the papers: her father is delighted that Mario has come to his senses, and her mother is quietly upset that her son has gone back in the ring. Neither suspects Maria is actually the “hero” of the bullfight. Maria doesn’t tell Pepe, either. He is already sensitive about how close Maria and Mario are, and how wrapped up Maria is in her brother’s hopes and dreams. He has a point: Maria doesn’t have much personality or her own aspirations or skills, and instead devotes all her time to helping Mario achieve his goals. All we know about Maria is that she can swim and she’s a good bullfighter, but obviously there is no real future in that for her–there are no lady matadors! Pepe worries that Maria will always be more devoted to Mario than to him, so she wisely doesn’t tell him that she is risking her life to rehabilitate Mario’s name. Two weeks go by and Mario still doesn’t hear about “his” great fight or his upcoming bout in Puebla (a lack of news that seems highly unlikely and very contrived). But when he stops at a roadside cafe, the radio blasts the Mexico City Symphony’s performance of a new composition by Mario Morales! Mario plays along with the radio before rushing to Mexico City to meet the maestro. Fun fact: Mario’s “Fantasia Mexicana” is actually Aaron Copland’s “El Salon Mexico” arranged by MGM’s Johnny Green. When Mario arrives at the conservatory, Contreras scolds him for continuing to bullfight, and asks him to promise not to show up at his upcoming fight in Puebla. Mario has no idea what he is talking about–then it hits him–Maria must be fighting in his place. Duh. So then he rushes off to Puebla. Meanwhile, Pepe shows up in Puebla with great news: he has gotten a job in New York but he has to leave the next day. So he suggests that he and Maria get married immediately. Off she goes for a quick ceremony (she doesn’t even change clothes and gets married in her burgundy suit!) before hurrying back to Chato and the bullfight. Meanwhile, her father and the maestro have come to Puebla, too; the former wants to reconcile with Mario, and the latter hopes to stop the fight. They run into each other, start arguing, and end up at the police station, so neither one sees the bullfight. Maria does an excellent job in the ring, but at the very end of the fight, Mario shows up. She gets distracted and the bull knocks her down. Mario jumps into the ring and uses his jacket to lure the bull away from his sister. Fortunately, they both survive the incident and the twins are reunited at last! They return home where Mario is greeted as a bullfighting and musical hero. Pepe has discovered the truth about Maria’s masquerade, but he promises not to tell her parents. Then Chato tells Antonio that Mario fought very well, but he lost focus, which is why the bull was able to knock him down. You may recall that Antonio has worried about this “flaw” in Mario’s bullfighting for years, so Chato’s story gives Antonio an out. He encourages Mario to pursue music and forget about bullfighting, which thrills everyone, especially Señora Morales. Newlyweds Maria and Pepe are presumably flying to New York the next morning, and Conchita and Mario are happy together once again. What a day! The end. 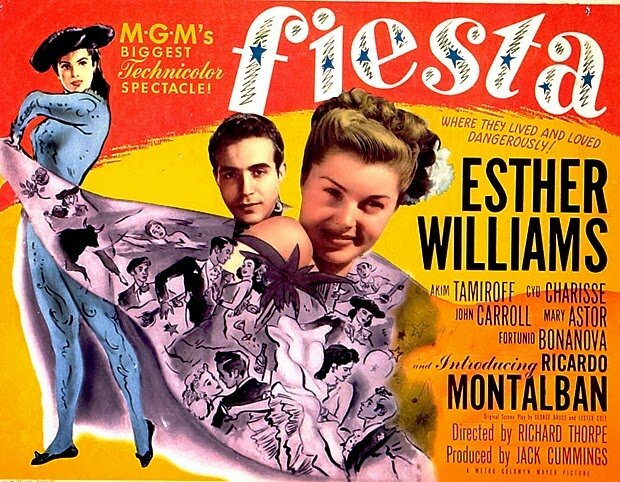 Principal production on Fiesta began on December 19, 1945 in Mexico, and continued for about three months before the film company returned to Los Angeles on February 18. They finished filming at MGM on April 15, 1946. Fun fact: According to Williams’ autobiography, production on this movie was not especially easy. For one thing, location shooting was far more unpredictable and difficult than filming on MGM’s backlot. The outdoor scenes they shot in Mexico included a lot more real dust, dirt, and logistical problems than the crew typically dealt with back at the studio; plus, the plot of Fiesta caused problems, too, especially the bullfighting scenes, as previously mentioned. Another problem arose thanks to Williams’ new husband, Ben Gage. The pair had been married on November 25, 1945, after which she almost immediately began working on Fiesta. But Gage soon joined her in Mexico and found a drinking buddy in Williams’ makeup man, George Lane. One night, after too many martinis, Gage and Lane went to the front desk of the hotel to pick up their laundry. A teenage boy was on duty, and he wasn’t especially cooperative with the drunk Americans. This infuriated Gage, who grabbed the young man and shouted at him. The kid screamed for the police, and Gage and Lane were arrested. Williams and a unit manager rushed to the jail and bailed the pair out the next morning. As soon as they were released, Williams, Gage, Melvina Pumphrey, Williams’ publicist, and a second assistant director fled Puebla for Mexico City until the ruckus died down. MGM decided to keep Williams and Gage out of sight until they could figure out how to handle the “fight” in Puebla. With Williams exiled to Mexico City with her delinquent husband, the crew shot as much as they could without her, though MGM worried that the Mexican authorities might shut down production in retaliation for the incident. But they were allowed to finish Fiesta as long as Gage and George Lane went back to the US for the duration of filming. To defuse the tension in Puebla, the production undertook a public relations campaign which included parties for the town after the bullfighting scenes wrapped, and sending Williams on public appearances around the area. Remarkably, MGM managed to keep the whole thing quiet from the press, so these details are all from Williams’ autobiography. Esther Williams apparently so exhausts the bull that only a slight pat on the animal’s head is necessary to force it to the ground. Mexicans, who might regard this as something of a laughing matter, will get extra footage showing the matador finishing off the bull with the use of banderillas. But fewer critics than one might think pointed out the fairly ridiculous plot, though John Maynard of The Journal-American summed it up quite nicely by comparing “the idea of Esther Williams posing as her matador-brother to Lana Turner playing centerfield for the Yankees in place of Joe DiMaggio without detection.” But even this silliness can’t detract too much from the otherwise enjoyable movie. 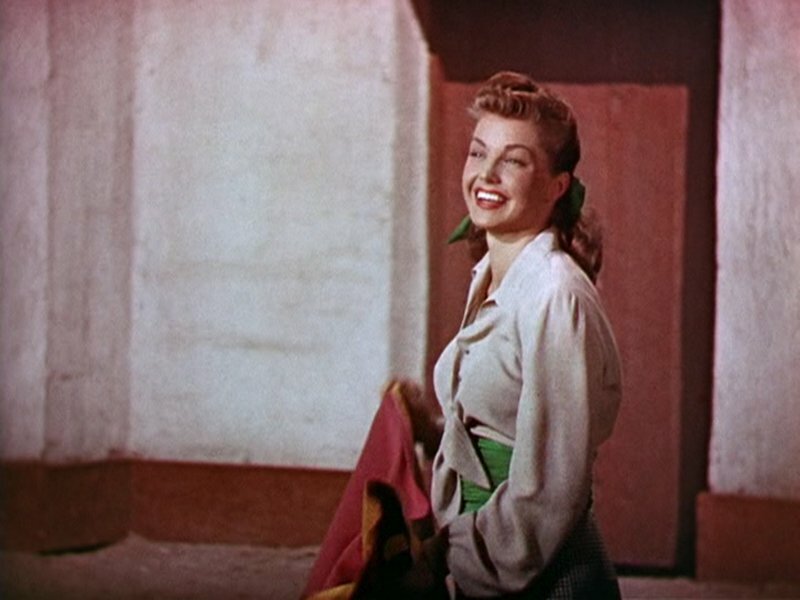 Variety called the movie “a Technicolorful trailer for Mexican-American goodwill,” and wrote that “It’s an eyeful of Esther Williams, alternating between a little of her familiar Jantzen symmetry and her pseudo-skill as a matador. 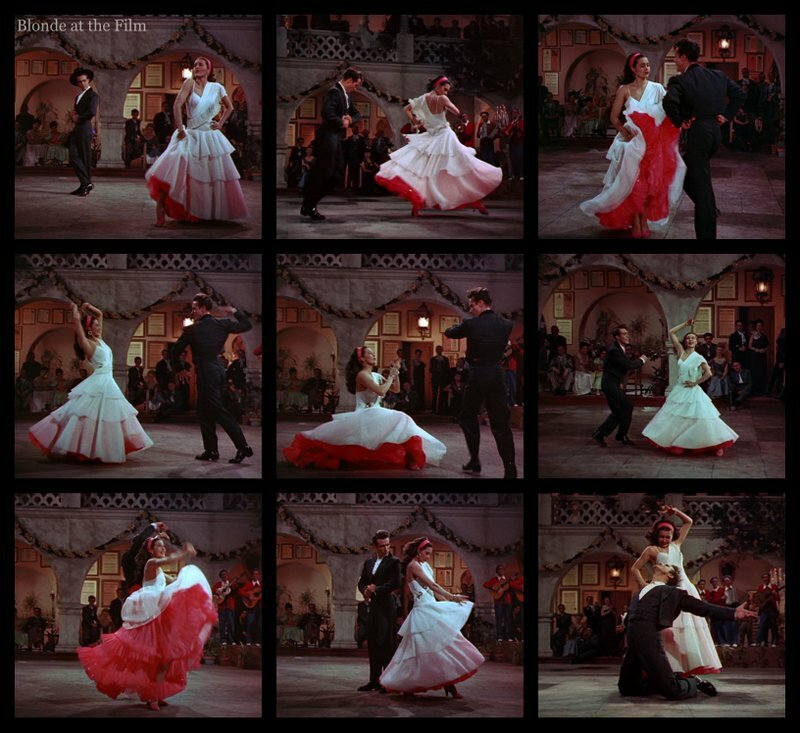 It’s also pleasant if not socko summer film fare.” As usual for MGM, the “production is lavish and the Technicolor lush,” Thorpe’s direction is “expert” and Green’s score and the dancing “are other plus factors.” In fact, Fiesta’s score was nominated for Best Scoring of a Musical Picture, but lost the Oscar to Mother Wore Tights (1947). Brimming over with good-will toward our neighbor republic, Mexico, Metro-Goldwyn-Mayer labored long and obviously at great expense to fashion ‘Fiesta’…But the musical, filmed there almost in its entirety, is only a cursory excursion below the Rio Grande struggling fitfully between snatches of excellent, staccato native songs and dances and a lame and weary plot. Still, it did great box office, which most likely helped push MGM to cast Montalban, Williams, and Charisse in On an Island With You (1948). You might be thinking of TEXAS CARNIVAL? 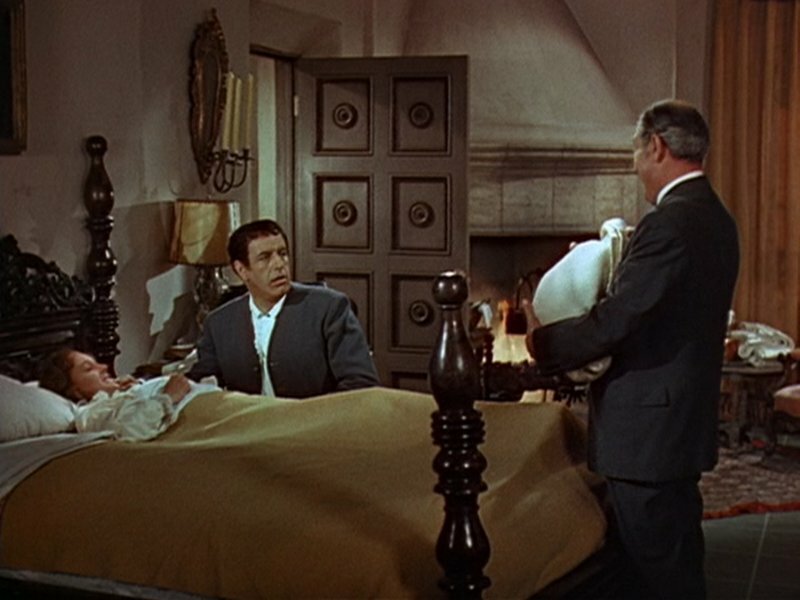 There is a great scene where Esther goes to a swanky hotel pool and has to use a blanket as a cover-up. 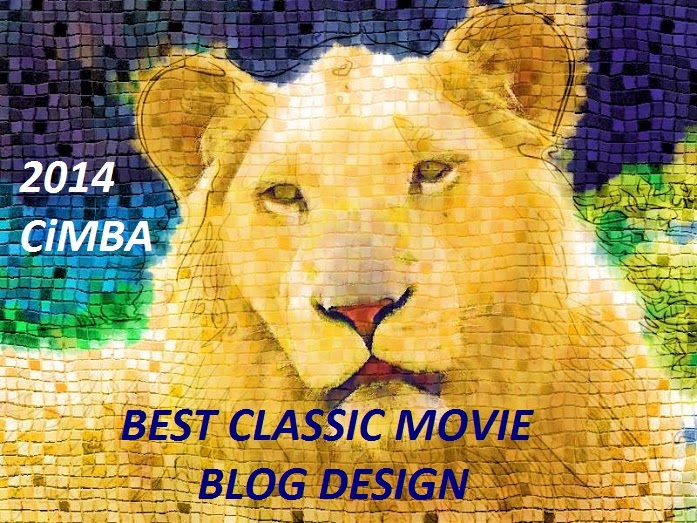 I wrote about that movie on the blog, too! I did not watch this movie. However, I get your point about representation and diversity. Hollywood was pretty much dominated with white actors back then and those of other ethnicities were practically non-existent.